Although we hadn't done it in a while, Friday nights are usually Pizza Nights for Dev and me. I make a pizza and we settle in to watch bad cable, a netflix movie or Friday Night Boxing- whichever is on. 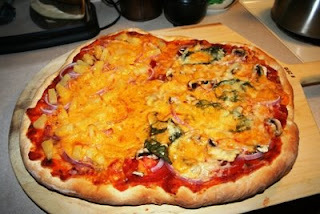 Because we hadn't had home made pizza in a while, I decided to go half and half. One half is hawaiian (Canadian bacon, ham, pineapple and red onion) the other half is veggie (onion, mushrooms, tomatoes, spinach and parmesan). I made a quick sauce from a can of crushed tomatoes, olive oil, red pepper flakes, garlic, red onion and a little sugar.